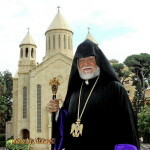 On Sunday, February 10, 2019, His Holiness Catholicos Aram I’s “Year of the Armenian Media” was read in Prelacy Churches. H.E. Archbishop Moushegh Mardirossian, Prelate, presided over Divine Liturgy and read the Pontifical message at St. Garabed Church in Hollywood. Divine Liturgy was celebrated by Parish Pastor Archpriest Fr. Vicken Vassilian. Among the faithful in attendance were Executive Council member Dr. Navasart Kazazian, ARF Central Committee member Garo Ispenjian, ARF “Karekin Njteh” gomideh members, representatives of community organizations, and Rose and Alex Pilibos School 7th and 8th grade students along with their parents and teachers. 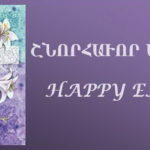 Prior to reading the message the Prelate greeted the faithful and, given that the day coincided with the eve of the fast of the Catechumens, explained the meaning of the fast which was instituted by St. Gregory the Illuminator and went over the forthcoming feasts. Addressing the students in particular, he urged them to remain faithful children of God and bring honor to their families, church, and community. The Prelate next read the Pontifical message, in which His Holiness highlights the unique and invaluable role of the Armenian media in our national life, in the forging of our nation and identity, and as an advocate and guardian of our language, literature, history, and cause. His Holiness underlines that the Armenian media has a leading role as a patron of our religious, moral, social, cultural, and national values and traditions, thus, all those in the media, whether editors, journalists, or contributors are worthy of our collective honor and respect. 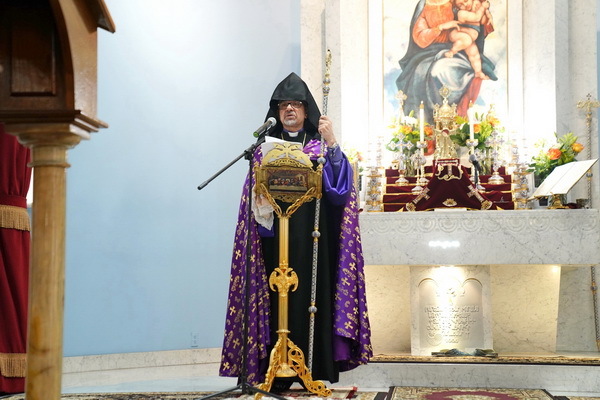 Following the reading, the Prelate announced that the Prelacy will heed the Pontiff’s message and aptly honor the role of the Armenian media throughout the year. During requiem service, prayers were offered for the soul of former Parish Pastor Archpriest Fr. Vatche Naccashian and yeretsgin Lousadzin. Fr. Vicken expressed condolences to the family on behalf of the Prelate, and announced that Fr. Vatche’s children had donated a chalice and lectern in memory of their parents, which were used during Divine Liturgy. Following church services, the Prelate conducted the blessing and dedication of the ARS “Mayr” chapter’s second office which Archpriest Fr. Vatche and yeretsgin Lousadzin’s children sponsored in their memory. Following the ribbon cutting, “Mayr” chapter chairlady Mayda Shahinian gratefully acknowledged Fr. Vatche’s legacy of service, the generosity of his children, and the work that is to be carried out at the second office, primarily the Saturday School. Two Saturday School students presented a recitation and musical performance. The Prelate reflected on his many years of work with Fr. 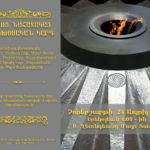 Vatche, commended the devoted service of the ARS and the gracious gesture of the Naccashian and Der Ghazarian families.